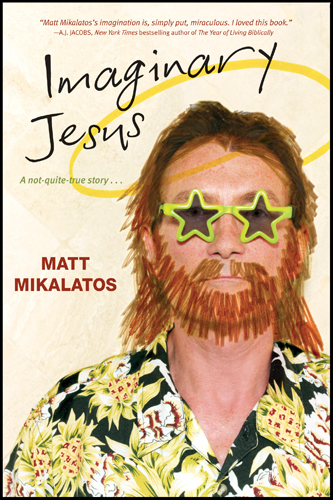 Here it is at last -- the official cover to Imaginary Jesus! The fine folks at Tyndale sent several rough drafts of possible covers to me back in July, and the early version of this cover was by far my favorite. It made me laugh, and I love the haphazard look to it, like someone just took a sharpie to a guy and made him look like Jesus. So, I'm pleased that this is the cover that was eventually agreed upon all around. The cover was designed by Beth Sparkman, who sent me this behind-the-scenes note about the cover design: "This image just jumped out at me as being so far out, and then when I scribbled the beard and hair on it with a half-dried up marker it got even more bizarre! But I thought it fit the wildness of the book so showed it to Nancy [marketing director at Tyndale] and Sarah [Tyndale acquisitions editor]. The rest is history. . ."
on Amazon and they will give you the lowest price between now and the release date in April! Notice also the official tag line... brought to us by the ridiculously clever Sarah Atkinson. Hope you enjoyed this little sneak preview. Now go out there, get a sharpie, and deface some posters. Awesome. I feel like I know him. I liked this cover and the Kavalier and Clayish looking one they made. This one is definitely more of an eye catcher. Love it! I would definitely pick it up to read the back! congrats matt! can't wait to read it! Who knew your imaginary jesus looked like Danny Bonaduce. Okay At least today on amazon, it seems that all the related items purchased by same people who pre-ordered your books are books by John Eldredge or his wife. Don’t you at least find that ironic? Free Mosaic Bible here at BHR!